The formation. It’s always about the formation, just ask any journalist who’s covered the England team in the last twenty years. I was watching Chelsea (who are no doubt some people’s title favourites) play at home against Reading, who though play some decent football, will surely be struggling in the lower realms of the Premier League come the end of the season. What struck me, as the clock ticked down towards half time with Reading 2-1 to the good with their fans singing loudly about how they now adorned the top of the most coveted league in the world, was that Chelsea were playing with a solitary striker. Why were they so concerned about packing the midfield, at home, against lesser opposition? Sure they have a forward who when on form (wearing a liverpool shirt) can do the job of two, but why the negativity? What is it with the rise of the lone striker? Just think of the problems this would have caused in ’96, no longer a brave Who Dares Wins, but a signal of distress, and we didn’t require it back then. Why the 4-1-4-1 or 4-5-1 or 4-1-3-1-1? Are modern managers trying to find something as powerful as the fibernacci sequence? Does it boil down to what Johan Cruyff famously said, “if you control the midfield, you control the game”? which anyone who watched the European championships earlier in the summer will have seen taken to the nth degree by the Spanish, who could have played a 3-2-2-2 and still come away with the title. They’d won the previous two major tournaments with different systems after all. 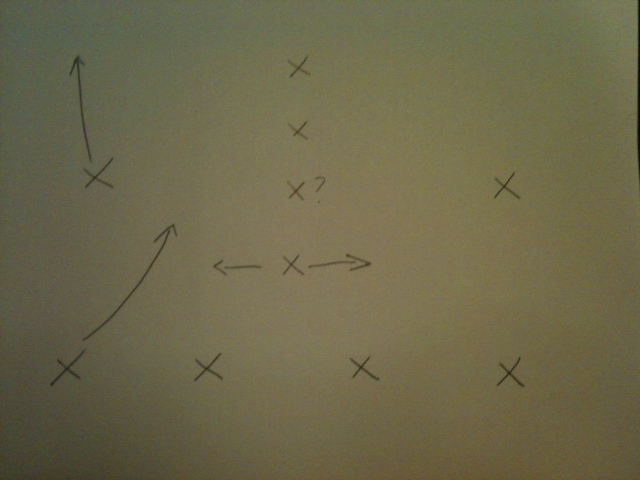 Which means does the formation matter or is it simply the players that count? Is there too much emphasis on the shape of a team, talk of fitting players into positions or buying players to play roles? We could take a specific look at Barcelona, who have dominated European football for the past five years with a fluid formation from midfield to attack, not to mention a tiny central midfielder at centre back and a right back who spends most of his masquerading as a right winger. Yet last season they won neither of the major two trophies and there was talk of this due to them not being willing to change their formation and tactics. Surely it was simply down to percentages and the fact that no team is invincible (alright apart from the Arsenal invincibles that one season)? The question is then, would the Dutch team of Total Football actually have won silverware if they’d swapped a second striker for a disciplined holding midfielder, or would they have slipped into obscurity like those really short shorts and the sweeper system?